“Impressive range of features at a reasonable cost. Favour’s winHR gets the top gong because, even for someone with limited understanding of HR it’s very easy to use and it’s obvious what each element of the application does and what it’s for “… Steven Turvey, RMIT (independent) Test Labs. Editor’s Choice, Australian Technology & Business Magazine. winHR & winOHS are unique client-server HRIS & OHS/WHS desktop software solutions which can be installed on your own server or hosted on an external server. The products are unique solutions because they offer the security, flexibility, and power of in-house Human Resources Information Management Software (HRIS) & WHS/OHS Safety Management Software as well as optional web browser access for employee and manager self-service for a realistic cost. As well as realistic pricing, it is user interface flexibility and advanced customisation tools which set winHR & winOHS apart from pure cloud based systems. Every field, tab, & screen is client definable and customisable to precisely match your existing naming conventions and structures, and additional new fields can be created ad hoc without relying on expensive vendor supplied customisations. These advanced features mean the software is adapted to align with your existing systems and practices rather than the other way around. Our implementation process includes configuring and customising the data base to align with your existing structures, workflows, and processes. winHR and winOHS are suited to all types of businesses and organisations; Favour Solutions has implemented more than 250 instances of these systems for a wide variety of business and Organisation types including Accountancy, Manufacturing, Construction, Legal, Government & Local Council, Regulatory Bodies, Mining, and many others. The products, due to their richness of functionally and affordability, are particularly popular in the Not-for-profit Health and Community Care sector. The systems enable concurrent access to data by multiple users (based on pre-defined permissions). The benefits you receive are efficient and easier recording and retrieval of data and superior data analysis through powerful out-of-the-box reporting tools. This results in enormous savings in time and significant improvement in process and efficiency. User defined email alerts keep managers informed of critical events, issues, and unfinished tasks. In essence, winHR & winOHS eliminate the need for spreadsheets and other disparate and unconnected systems by centralising your data into a single unified data base solution. Information is ordered into separate, but fully integrated sections (screens) specifically designed to accommodate the type of information being entered or captured. Small-to-medium enterprises (50-300 employees) face the same HR & WHS/OHS data management and compliance challenges as do larger companies, albeit on a different scale. However, the magnitude and variety of information can still be enormous and equally as complex to maintain and track. In fact, even the smallest business entity today is saddled with large data management & record keeping obligations. The problem is, smaller organisations rarely have the budget to purchase high-end Human Resource Management Systems and/or OHS/WHS Safety Management Systems, and much less do they have the resources in time & people to implement complex systems which can take months or even years to complete. 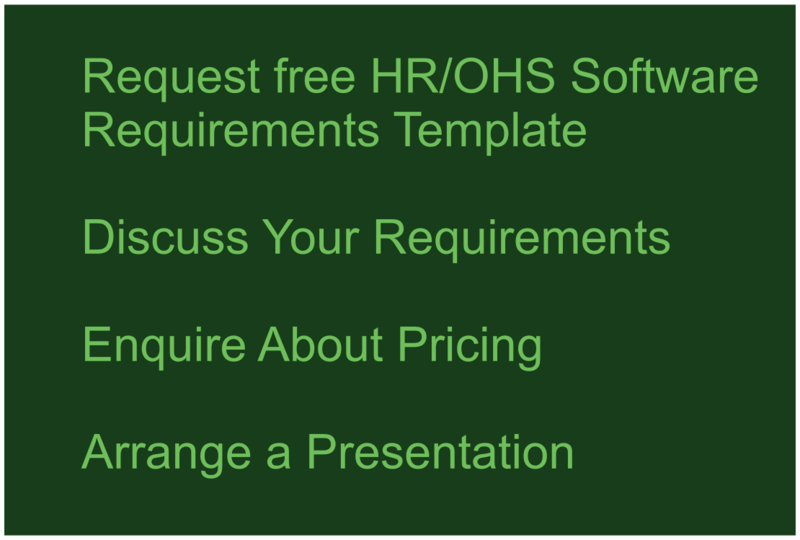 winHR, winOHS, and the optional webHROHS have been designed to be easy to use and implement. They were specifically developed to fill the gap between high-end expensive products and very low end, functionally limited products. Our pricing model is based around a realistic once off purchase price which includes the software license, installation, implementation, and training on the system. There is a modest annual fee covering telephone & email support, product upgrades & enhancements, and access to the members section of our website for regular tips hints. To discuss your requirements in more detail, schedule an online presentation, or to enquire about pricing, call us on 1300 657 158 or click here to request contact from a Favour Solutions consultant.